Centenarians are the fastest growing segment of the population in just about all industrialized nations. Not only are more of us reaching the ripe old age of 100, according to dentists, many of us are likely to have more of our natural teeth when we get there. Dental professionals say we are experiencing a fundamental shift in the profession regarding their older patients. The number of patients seeking dental care into their 80’s 90’s and beyond is steadily increasing – and believe it or not their treatment is now centering more on natural teeth, then on creating full or partial dentures. The dental professional knows that the population of centenarians is growing, and as a whole the group seems to be wearing fewer dentures and are keeping their natural teeth longer. It seems that as a whole, more centenarians are keeping more of their natural teeth. 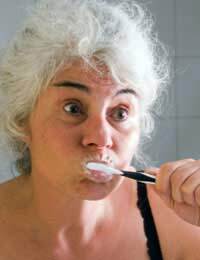 Still as a group such older individuals have some very specific oral health concerns. One, many centenarians may not have the mobility or the dexterity of younger patients and this can make routine dental hygiene, such as brushing and flossing more difficult. On the other hand as a group centenarians seem to care more about their overall health, that is part of what has helped them to achieve such longevity. So as such centenarians tend to at least want to take better care of their teeth then other groups of older dental patients, even if they are not always capable of doing so. Centenarians very likely have “sliver fillings”. These fillings actually contain mercury, as they were done long before these materials were no longer used in dentistry. The mercury in such fillings has been known to leech out and cause a variety of health problems. In some instances “silver” filings have been linked to increased risk of Alzheimer’s disease. While a large number of centenarians have retained many of their natural teeth, still many of them have full or partial dentures. For older individuals and especially centenarians, full or partial dentures can create their own oral health issues. Ill fitting or loose dentures can cause older people and especially centenarians to not eat properly. This can lead to nutritional issues. Even good fitting dentures can cause their share of problems in a centenarian’s mouth. Older folks with partial dentures are more prone to gum disease or deep root decay. Furthermore the centenarian with “false teeth” may erroneously believe that they no longer need to worry about dental care or oral heath since they no longer have their natural teeth. This of course is untrue. It is true that a mouth that is 100 years old is bound to have its share of dental problems. However centenarians that have practiced life long good dental habits may very well have good oral health to thank at least in part for their longevity. Study after study has shown that gingivitis also known as gum disease can cause complications in other parts of the body. In fact the American Heart Association recently released a report that concluded that regular teeth brushing and flossing could help prevent heart disease and stroke. It seems that the bacteria that cause gum diseases and their by-products can travel through the blood stream and clog or otherwise damage the crucial blood vessels leading to the heart or brain. This can cause heart attack, stroke or other types of cardiovascular disease. Thomas Perls, director of the New England Centenarian Study found that a majority of the centenarians he interviewed were regular flossers. Will brushing your teeth and flossing regularly really help you live longer? That is hard to say. But you can rest assured that if you live to 100; you will likely have a lot to smile about. And your local newspaper will undoubtedly want to print your picture when you hit 100 years of age, so why not start taking better care of your teeth right now? You never know.